Lookout Studio at the Grand Canyon. Historic Places to Visit. Lookout Studio, situated majestically on the Grand Canyon’s South Rim, is a highly-revered travel destination. History, rich culture, beauty, and nature come together to create an enriching experience. Lookout Studio, which is also referred to as “The Lookout” was constructed by the popular Santa Fe Railway in 1914. Its design stemmed from the artistic imagination of the famous female architect, Mary Colter. The stonework seen on the outside of the structure conveys the general tone given off by the ancestral Puebloan-based dwellings discovered in the region. Instead of a standalone structure like those American Indian buildings, she designed Lookout Studio in such a way that it appears to grow from within the depths of the rim. The creation of this exquisite building combines the historical, the natural, and the imagination. Lookout Studio was heavily inspired by the gorgeous landscape that surrounds the building. When observing this building, you will discover that the multi-level rooflines and chimneys resemble that of the bedrock that surrounds it. 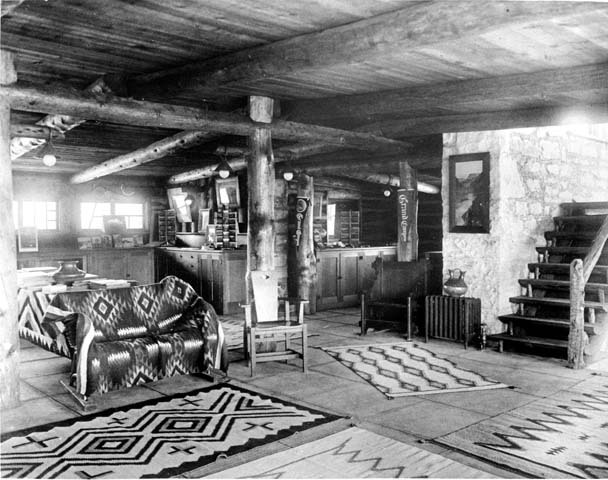 To integrate the forests, Mary Colter integrated logs within the joists of the ceilings, the beams, as well as the posts. Carefully placed windows were placed throughout the building so that visitors could observe the beauty and majesty of the best views of the Grand Canyon. The interior walls are also composed of exposed stones from the region. Built directly into the rim, this appealing building seems to grow out of the Grand Canyon itself. Mary Colter was and still is considered to be one of the most documented and highly-prolific architects of the historical American West region. Her visions always included the components of both form and high levels of functionality. Not only did Colter have a desire to emulate the natural aspects of the rim through the use of the stones and wood found in the area, she also wanted to emulate the construction styles of the southwestern American Indians. In fact, in today’s world, this style of building is often referred to as “Parkitecture”. Numerous national parks now emulate this style by constructing buildings that blend in with the natural environments in which they are located. 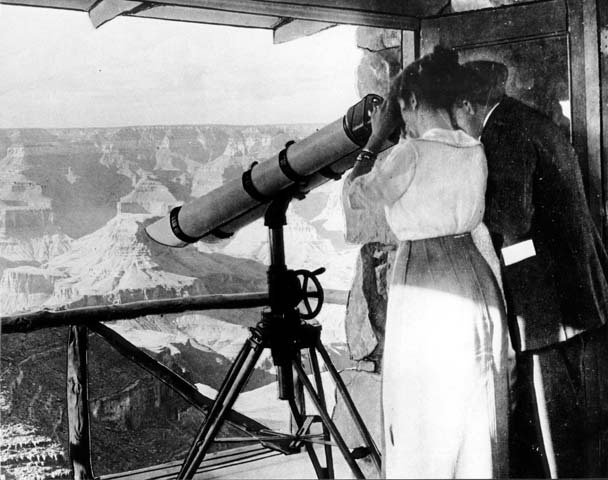 Visitors to the park in the early part of the 20th Century could view the immense trails and the inner regions of the Grand Canyon by simply looking through telescopes that were placed strategically on the porches of the Lookout. Trails and destinations observed were Indian Garden, Phantom Ranch, and Plateau Point. In addition to immense views, Lookout Point offered a warm fireplace, a place to relax and unwind, and a popular location for socialization. When Lookout Studio opened, there was a fair amount of competition which originated not too far away at the photography studio, owned and operated by the Kolb brothers. This business offered pictures, arts, souvenirs, and other types of gifts that displayed the most attractive views of the Grand Canyon. Lookout Studio offered a souvenir shop by the Fred Harvey Company. This shop also sold amazing art and photography pieces. While the two companies were at odds in terms of business competition, both fared well due to the immense number of visitors that visited the beautiful area of the rim. Lookout Studio offers many unique activities and adventures for guests. When visiting this focal point, you can enjoy a historical tour, witness the rare California Condor, and observe the region. There are telescopes, coin-operated viewing scopes, paved trails, and many natural trails. The building has three levels, in all. The main region has a souvenir shop and has an enclosed, safe area designated for observation. This is the perfect area for those seeking gorgeous images of hard-to-see areas of the Grand Canyon. Lookout Studio was designated at a National Historic Landmark in May of 1987. It is part of the Mary Jane Colter Buildings Historical Landmark group. It is considered to be one of the main contributors to the District known as the “Grand Canyon Village National Historic Landmark District”. Mary Colter also created five other buildings – apart from Lookout Studio – that are considered to be of high historic significance and are enjoyed by millions of people annually. These include Phantom Ranch, Bright Angel Lodge, Desert View Watchtower, Hermit’s Rest, and the Hopi House. Lookout Studio is a wonderful travel destination situated in the South Rim region of the Grand Canyon National Park. Not only is this adventure perfect for the whole family, it is a wonderful area for weddings, honeymoons, sightseeing travels, hiking, mule tours, and more! If you are planning a trip to the Grand Canyon, make sure to stop at Lookout Studio, as well as the five other buildings designed by Mary Colter. To maximize your experience and your views of the Grand Canyon, schedule a helicopter or airplane tour today!